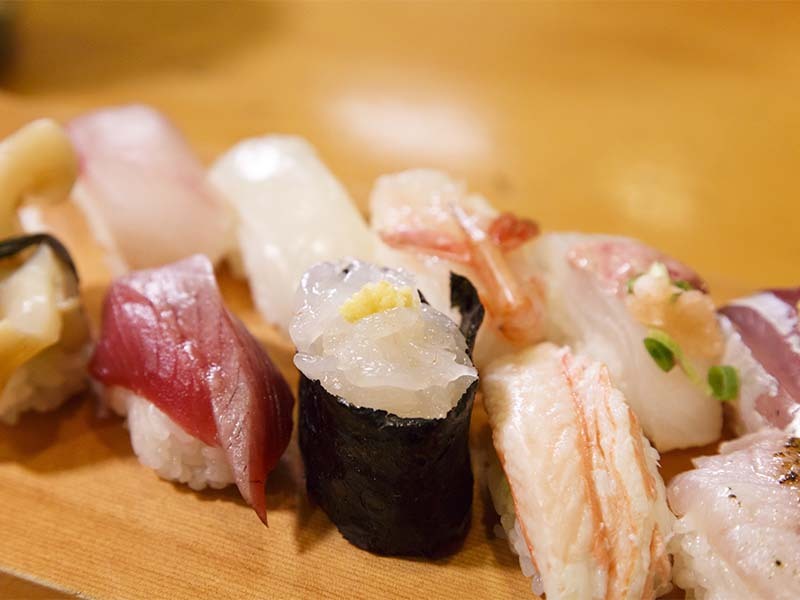 The sheer depth and intricacy of Japanese cuisine, from regional classics like Hiroshima-style okonomiyaki comfort food to Michelin-starred chefs’ takes on tempura, can make navigating the dining landscape here as bewildering as perusing the menu at a Tokyo sushi bar. Japan: a feast for all the senses. Here, your handy guide to the best of Japan’s unique food and drink. Eating your way around Japan is the ultimate feast for all the senses. Whether you’re plucking a perfectly sliced, translucent pink piece of sashimi off a delicate ceramic dish, marvelling at dizzying rows of delicately colourful sweet treats, or merrily clinking cold beers over a steaming bowl of ramen in a lively izakaya, one thing quickly becomes apparent: when it comes to food, like all things, the Japanese do not do things by halves. From an emphasis on fresh local produce, to samurai-worthy knife skills, to creating a painstakingly perfect ambience, no stone is left unturned in the quest to create magical food memories for the lucky diner. Why not make it you? Japanese cuisine has spread to foodies all over the globe, but arguably, there’s no better place to seek out your cult favourites than in their homeland: and Tokyo’s the perfect place to start. At Sushi-Bar Numazuko Ginza 1st, in the upmarket Ginza shopping area, you’ll find a winning trifecta of Japanese icons: sushi, conveyor belts, and sake. Showcasing fresh seasonal seafood (try the sea urchin, piled up in the shape of another icon: Mt Fuji), this fun and reasonably priced little gem is a great mid-shop stop. For an unforgettable dinner, tempura fans should make a beeline for Michelin-starred Tempura Motoyoshi, where fresh vegetables, seafood and other ingredients are treated to the wizardry of master chef Kazuhiro Motoyoshi in an elegant, intimate setting. Forget pale (or soggy) imitations – this is the real deal: impossibly light and crispy, the tempura perfectly showcases the stunning natural flavours of the produce. Japan’s two most famed beverages offer visitors a chance to imbibe a sense of the culture behind them, as well as the drinks themselves. At Sudo Honke, a family brewery in Obara, Ibaraki (north-east of Tokyo), the region’s pristine waters have been used for over 800 years to create exceptional sake. Take a tour of the brewery, surrounded by ancient trees, soaking up age-old traditions as you sample some of the finest sake in Japan. Back in Tokyo, the sophistication of the Ginza shopping district carries through to Higashiya Ginza’s charming blend of ancient tradition and modern sensibility. This beautifully designed confectionary shop and tea salon offers over 30 varieties of green tea and a selection of wagashi (traditional Japanese sweets), all aimed at celebrating seasonal influences. Yes, there are plenty of serene settings in which to appreciate the subtle beauty of Japanese cuisine. But families (and general fun-loving foodies) might also be surprised by the number of lively dining experiences dished up all around the country. In Hiroshima, head for Okonomiyaki Nagataya, where national comfort food okonomiyaki (a savoury, thick pancake packed with vegetables, seafood or meat, topped with inimitable Japanese mayonnaise and tangy sauce) is made in the unique local style. Choose your favourite fillings, and your personal creation will be cooked to order on the tabletop frying surface. In Kyoto, Fire Ramen Menbakaichidai delivers on its name, dishing up moreish soy-flavoured, spring onion-laden ramen noodles on an impressive pillar of fire, thanks to the chef’s technique of pouring burning oil over the dish to draw out extra flavour. It’s the perfect pit stop after a day exploring Kyoto’s nearby Nijo Castle. Back in Tokyo, search for the retro-style izakaya (Japanese-style pub) Manpuku Shokudo, nestled under train tracks and clad in old film posters – a bustling setting for eating, drinking and being merry amongst locals letting off steam after work. French and Japanese cuisine may (literally) be worlds apart, but they share a reverence for subtle sophistication, and the elevation of excellent produce by highly skilled master chefs. Joel Robuchon Restaurant, located in a ‘chateau’ in Ebisu, Tokyo, boasts no fewer than three Michelin stars; its ethos of ‘cuisine actuelle’ focuses on letting the ingredients shine through, with sublime service, plush decor and all the requisite top-notch trappings. Further north, French fine dining restaurant Michel Bras Toya Japon will take your breath away with its gorgeously plated odes to Mother Nature, all served up in a stunning elevated setting overlooking the mountainous blue expanse of Hokkaido’s Lake Toya – a truly unforgettable experience.